Natalie Kershaw: We're privileged to have the right to vote - use it or lose it. We're privileged to have the right to vote - use it or lose it. As the General Election approaches and the political parties step up their campaigns and canvassing, attention has once again been brought to the proportion of younger voters who do not exercise their right to vote. In the 2010 General Election, only 44% of those aged 18-24 turned out to vote, compared to 76% of over 65s. Young people wonder why politicians don't listen to them, or direct policies towards them, and the answer is right there. If the biggest proportion of voters is in the 65+ bracket, why would politicians target those who aren't going to turn out to vote? Pensioners get free bus passes, winter fuel allowance and more - because they are the ones who vote. In 2010, young people were promised the world by Nick Clegg and the Lib Dems when they said they would scrap tuition fees. Instead, they joined forces with the Conservatives and saw them, in some cases, tripled. It's no wonder really that young people don't have any confidence or belief in the political world. But the more young people who go out and have their say, the more chance they have of being heard. 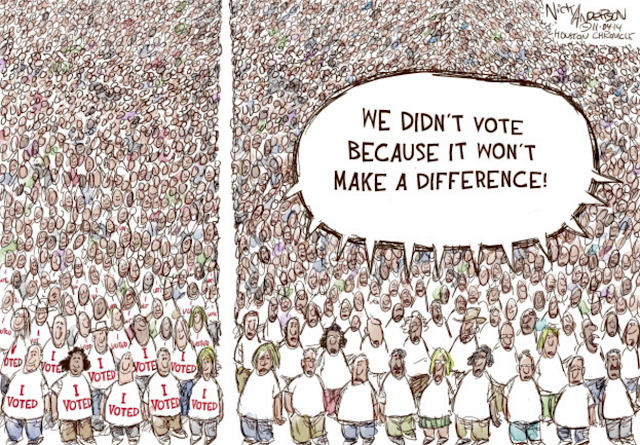 Many people I speak to around my age said they don't vote because their vote won't make any difference, or they don't care. But if the 56% of people who didn't turn out last year, had gone to vote - those votes would've made a huge difference and could have seen a totally different structure of government. The right to vote is taken for granted by far too many people; in all age groups not just the 18-24 bracket. There are nations in the world, even today, who are denied the right to have their say. People still are dying fighting to have their chance to get their voice heard and overthrow dictatorships and extremist governments. To have the chance to walk into a polling booth and vote for someone you believe could make a difference is hugely powerful. And, for all of those who say they aren't interested, don't care or don't understand, you don't have to vote for anyone. If you truly don't want to vote for any party, spoil your ballot. But go to the polling station, have it registered that you turned out, and spoil your paper. One day, we may be met with a government who change the structure of voting and the elections - meaning that we lose our right to vote. Once it goes, I am sure everyone would be incensed and would suddenly be advocates of voting. Campaigners in this country, namely the suffragettes, died to ensure that we could have the vote today. Women and men battled for years to give us the freedom that we have today. Whether or not you agree with the politicians and the candidates and the policies that they promise, exercise your right to vote. Polling stations are open all day and everyone has one near to them - meaning there really is no excuse. If you don't use it, we could all lose it.